games and Sky Manga (e-books). MAGIC is JAL's inflight entertainment system that provides a wide range of programs from movies, videos, music, games and more. *In some cases, the previous month's programming may be playing at the beginning of the month, or the next month's programming may be playing at the end of the month. You can see movies, videos, audio and Sky Manga (e-book) programs. 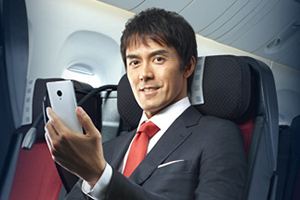 Enjoy movies, JAL original video programs, news, and more during your flight. Asami's boyfriend loses his smartphone and she retrieves it for him. Trouble follows: credit card frauds, cyberstalking, hijacked social network accounts… A suspense film about the terrors of modern life. We have prepared for you a wide range of audio genres ranging from the latest pop music to rakugo (comic storytelling) performances. Enjoy the music of artists with London origins and the birthplaces of works that wowed the world—live houses, stadiums, the West End and more. Queen "Bohemian Rhapsody," Adele "Chasing Pavements," Ed Sheeran "Shape Of You" and more. Enjoy reading manga and other digital books on our Boeing 787 flights. Have fun or test your skills inflight with our game selection in each MAGIC (inflight entertainment system) version.Depending on the type of MAGIC, the game you enjoy may differ. In this second prequel to the Harry Potter films, wizard and “magizoologist” Newt Scamander is on a new quest to find the Black Wizard. The world of wizardry expands and is filled with new surprises. A drowning accident leaves a young girl brain dead. The parents keep the girl alive, praying for a miracle, but the situation turns awry. Ryoko Shinohara is impressive in the role of a desperate mother. Songs to cheer you on in the season of new beginnings. The Rolling Stones "Start Me Up," Rachel Platten "Fight Song," Keala Settle & The Greatest Showman Ensemble "This Is Me" and more. In 1985, Russian boxer Ivan Drago killed World champion Apollo Creed in a tragic match. Against the wishes of trainer Rocky Balboa, Apollo’s son Adonis Creed accepts a challenge from Drago’s son. It is based on a true story of Yasuaki Shikano, who has muscular dystrophy and depends on a team of volunteers to maintain his life. He is willful and brash, but his carers learn to love him for his forthright attitude. Songs about flowers and introductions to famous flower spots in Japan and around the world. Enjoy the spectacular views and colorful flowers of Shikisai-no-oka in Hokkaido and the wisterias of Ashikaga Flower Park in Tochigi. SMAP "Sekai Ni Hitotsu Dake No Hana," Scott McKenzie "San Francisco," Enya "China Roses," Bette Midler "The Rose" and more. *Information is updated around 20th of every previous month. You can view the titles of movies that will be available for viewing. Please note that circumstances may prevent certain movies from being available. Program content is subject to change. Occasionally, the lineup at the beginning of the month will be the same as the previous month and that at the end of the month will be the same as the following month. Audio content is not available on some Boeing 787 aircraft. Program or channel may differ from aircraft. Stay connected to internet onboard. You may connect your smartphone, tablet PC, laptop PC or other Wi-Fi capable device to internet onboard.